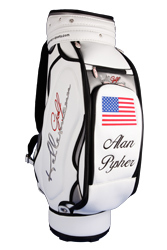 I HAVE THE BEST LOOKING GOLF BAG IN THE USA! 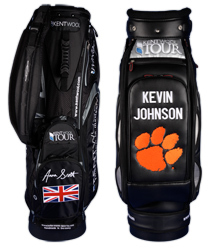 Kerstin, thought you might like to see how the bag will look on the course! Took the picture with my cell phone so the quality is lacking. However, this bag looks so great in person that pictures don't do it justice! Several people have asked how to get one. The bag looks amazing Kerstin! I received the bag and absolutely love it! Kerstin - I really appreciate you sending the pictures. I have been anxious to see the finished product. I received notification of shipment last week and have been looking daily to see the progress. I suppose it is somewhere in the middle of the Atlantic about now. The bag looks great. I am so impressed with what you were able to do. I can't tell you how much I appreciate you making this such an outstanding purchasing experience. You were so patient as I decided what I wanted to do and were very helpful with all the mock-ups. Thanks isn't enough to express my appreciation. Kerstin - Just wanted to let you know my bag arrived Friday. I couldn't believe how quickly it got here. I was so pleased when I opened the box. 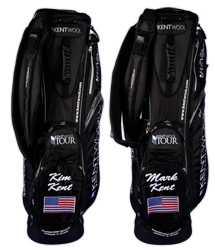 The bag looks simply amazing, and the color on the logos is perfect. I said it before, but I just can't express how impressed I am with the quality and the craftsmanship of the bag. Thank you again so much. I am sure I will enjoy it for years to come. Hi Kerstin! Kim and my bag arrived. They look wonderful!!! in person! You are the best! Let me know when Kevin's ships on Monday. 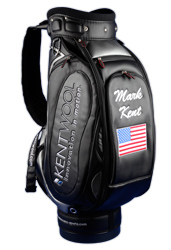 Tour Bag Montecastillo M3 "Flag/Name"
Kerstin, I received the Montecastillo white golf bag and it is beautiful. Thank you for you expert craftsmanship and speedy shipment . . .
Got the bag...I cant describe how excited she is in an email...thanks for all your help. special. The quality of craftsmanship is second to none! Congratulations! 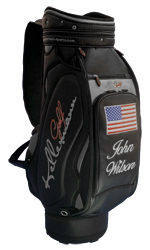 I am looking forward to many lower rounds of golf with this great bag! will give you her feedback. I can only imagine she will love it! Tour Bag Montecastillo M3 Custom Stitch weiss "Exklusivdesign"
Thank you - the finished product looks absolutely fantastic! !